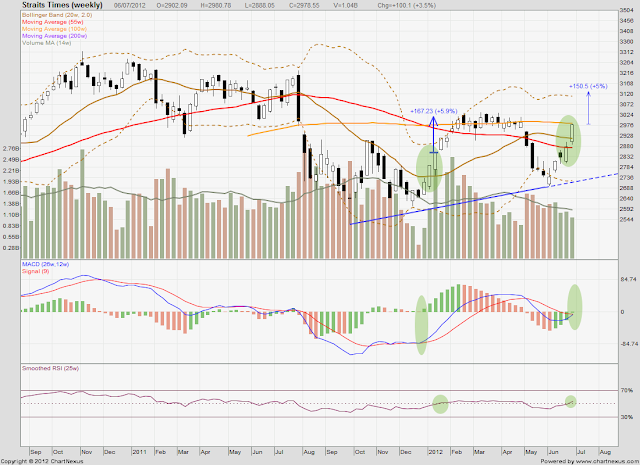 healthytrading: The STI Stock Rally Still Has Some Legs Left? The STI Stock Rally Still Has Some Legs Left? The rally started some 5 weeks ago when sentiments were terrible but it was not totally unexpected. I made several correct buy calls in the lead up and during this rally as you may find in the "Historical Stock Calls" section of my blog. There was a strong technical setting that gave evidence to this pent up negative sentiment that will eventually swing the pendulum in the other way; temporarily or not, we still do not know. If you look at the weekly STI chart below, it was clear that the STI was due for a rebound 5 weeks ago when the first white candlestick appeared below the lower bollinger band. In an elastic rubber band case, it is in a way of overstretching it too far, with the first signs of it winning the war and tighten. 1 week later, MACD histogram registered its first green bar together with a white candlestick that ended higher, which marked a more complete 2 signal confirmation that there is a much higher possibility of a rally. Now the question has to be if this rally still has legs to run? Well, to me, it is a yes. 1. On a technical and momentum driven set up, parallels can be drawn with the year-start rally. And if I were to project the same momentum driven gains from the previous rally, one will expect the STI to have some fuel left to run another 5% at best. Nonetheless, there are 2 key obstacles in the way - the 100w MA line which has proven to be a very strong resistance point for the STI in the year-start rally when it only went at best 1% above it. The second is a upper bollinger band which is around 4% from current index points. I would discount everything and put a figure of around 3-4% TP point when this rally finally sizzles out (news hasn't been good lately still and the market has been kind of ignoring these, biased with momentum). 2. Based on my earlier article on the correlation between Dow performance and the US earnings season, there is good empirical evidence to believe that the next 2-3 weeks will provide good further yields to the current positions. (That is of course assuming that Dow and STI are correlated as well) Alcoa will kick off the traditional earnings reporting season on 9 July Monday and going by statistics, we may well be in another good mood for the next 2-3 weeks. I like the set-up here on a technical and mathematical basis and I will still be keeping my eggs in and slowly easing out in the next 2-3 weeks. Healthy trading.